Now you have a chance to ask question, sit inside, and drive electric cars from people that actually own them in cities throughout California starting this month of May. The meet-ups feature the Tesla Model S and other EV’s like the Ford Focus Electric, Fiat 500e, Chevy Volt, Nissan Leaf, Smart ED and others. 1. Introduce drivers to EVs and build awareness about electric cars in the community. 2.Build personal relationships with other members of the EV Quorum car club. If you have questions or speculations about electric cars, I encourage you to come and ask any thing you want before and after you drive. This amazing car club is letting you drive their EV’s because they want you to understand them better and also so you have the knowledge of EV’s when considering a new vehicle. 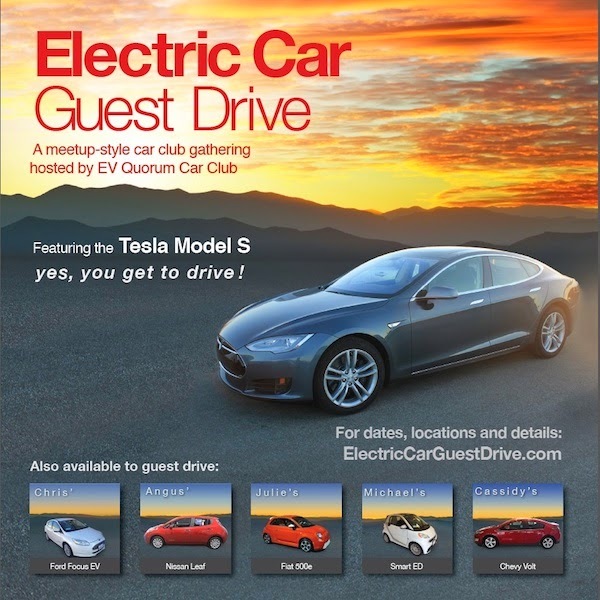 The Electric Car Guest Drive is co-hosted by EV Quorum car club, local Electric Auto Association chapters and sponsored by Electric Car Insider magazine. These driving events will be held in 12 cities stretching from Sand Diego to Santa Rosa north of the San Francisco Bay Area and allow 50 guest drivers per event.